Western Hognose snakes are relatively small, stout-bodied snakes found throughout the Great Plains states of the U.S. from Canada to Mexico. Other names include Blow snake, bluffer, (western) hognose snake, faux viper, prairie hognose snake, spoonbill snake, spreadhead snake, Texas hognose snake and Texas rooter. Their colour and pattern is highly variable from subspecies to subspecies, although most specimens appear much like the infamous rattlesnake to the untrained eye. This optical bluff, used in conjunction with a wide array of other clever defence tactics, makes these snakes quite unique among North American serpents. Although there is still debate whether Heterodon is mildly venomous or nonvenomous with toxic saliva, it is generally agreed that the species is indeed venomous. Regardless, the extremely rare bite from this rear-fanged snake is of no medical importance to humans. Males are considerably smaller than females, with adult lengths rarely exceeding 15-20 inches. These snakes get their common name from the modified rostral (nose) scales that are formed in an upturned manner, providing a very "hog-like" look. Additionally, this adaptation makes these snakes adept burrowers, which is a useful skill when hunting or seeking refuge from the elements. Even though this snake does not cause harm to humans, people are the snake's biggest threat. 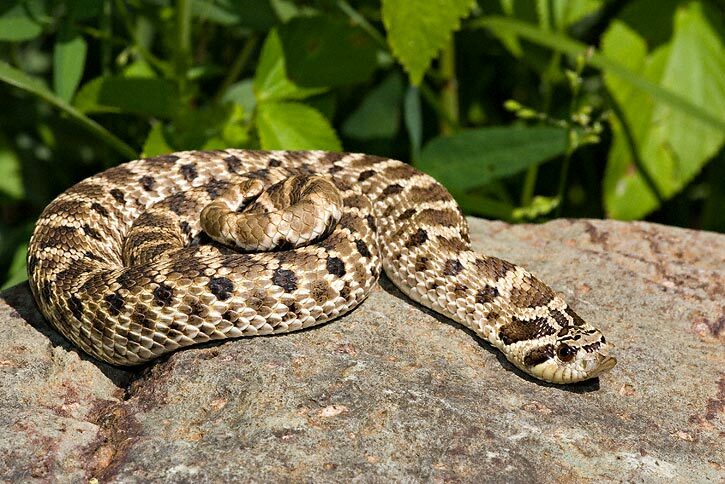 People often mistake the hognose for a rattlesnake, killing it to protect themselves. Educating people that the hognose snake is harmless will increase the survival of the species. The western hognose snake is primarily diurnal. It is typically a docile snake (though known to be highly aggressive in some individuals). If threatened (or perceiving a threat), it may flatten its neck (much like a cobra), hiss, and make mock strikes if harassed. Occasionally, if stressed enough, it even plays dead. Although it is more common that they will flatten their heads out, some individuals may puff up, filling their throats with air. In the wild, they feed predominately on amphibians, such as large and medium-sized tree frogs, as well as small or medium-sized toads and small lizards. There have been accounts of H. nasicus eating the occasional rodent in the wild as well. Not being a true constrictor, Heterodon bites and chews, driving the rear fangs into the prey as a way of introducing the saliva/"venom" into the bloodstream in order to incapacitate its meal. Click HERE for a Western Hognose Snake care sheet.